The Durban Chamber of Commerce and Industry, in partnership with Vodacom, recently hosted its inaugural Young CEO's Breakfast at the Chamber's Conference Centre in Morningside, Durban. The event focused on the role of technology in business growth and how young entrepreneurs and business leaders can be drivers of technology in their businesses as well as the economy. 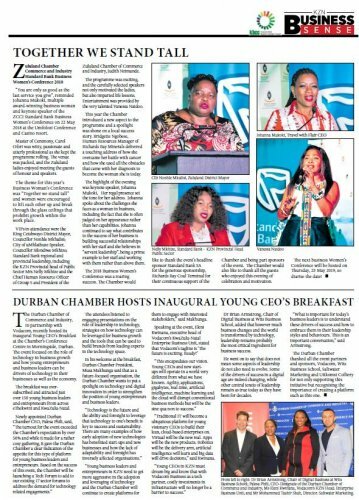 The breakfast was oversubscribed and attracted just over 150 young business leaders and entrepreneurs from across eThekwini and KwaZulu-Natal. 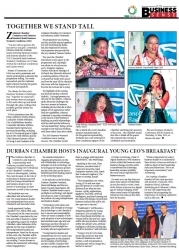 Newly appointed Durban Chamber CEO, Palesa Phili, said, "The turnout for the event exceeded the Chamber's expectation by over 50% and while it made for a rather cosy gathering, it gave the Durban Chamber a clear indication of the appetite for this type of platform for young business leaders and entrepreneurs. Based on the success of this event, the Chamber will be launching a Tech Forum to add to our existing 17 sector forums to address the demand for technology related engagements." The attendees listened to engaging presentations on the role of leadership in technology, strategies on how technology can be leveraged for business growth and the tools that can be used to build brands from leading experts in the technology space. In his welcome at the breakfast, Durban Chamber President, Musa Makhunga said that as a future-focused organisation, the Durban Chamber wants to put a spotlight on technology and digital innovation in order to strengthen the position of young entrepreneurs and business leaders. "Technology is the future and the ability and foresight to leverage that technology to one's benefit is key to success and sustainability. There are many examples of how early adoption of new technologies has benefitted start-ups and new businesses and how the lack of adaptability and foresight has inversely affected organisations." "Young business leaders and entrepreneurs in KZN need to get more aggressive in the adoption and leveraging of technology and the Durban Chamber will continue to create platforms for them to engage with interested stakeholders," said Makhunga. Speaking at the event, Eleni Kwinana, executive head of Vodacom's KwaZulu-Natal Enterprise Business Unit, stated that Vodacom's tagline is 'The future is exciting. Ready?' "This encapsulates our vision. Young CEOs and new startups will operate in a world very different from what we have known. Agility, applications, gigabytes, real-time, artificial intelligence, machine learning and the cloud will disrupt conventional business methods but will be the sine qua non to success." "Traditional IT will become a ubiquitous platform for young visionary CEOs to build their lean, cloud-based enterprises on. Virtual will be the new real. Apps will be the new products. Robotics will be the delivery arm, artificial intelligence will learn and big data will drive decisions," said Kwinana. "Young CEOs in KZN must dream big and know that with Vodacom Business as a tech partner, costly investments in infrastructure will no longer be a barrier to success." Dr Brian Armstrong, Chair of Digital Business at Wits Business School, added that however much business changes and the world is transformed by technology, leadership remains probably the most critical ingredient for business success. He went on to say that does not mean some aspects of leadership do not also need to evolve. Some of the drivers of success in a digital age are indeed changing, while other central tenets of leadership remain as true today as they have been for decades. "What is important for today's business leaders is to understand these drivers of success and how to embrace them in their leadership styles and behaviours. This is an important conversation," said Armstrong. The Durban Chamber thanked all the event partners and sponsors, Vodacom, Wits Business School, Saltwater Marketing and Uitkomst Colliery for not only supporting this initiative but recognising the importance of creating a platform such as this one.